Windhoek — Namibia and the United Arab Emirates (UAE) this week expressed interest in establishing reciprocal diplomatic missions and the possibility of supplying refined oil to Namibia. This was announced by the Office of the President yesterday after President Hage Geingob concluded a successful mission to Abu Dhabi where he attended the Zayed Sustainability Prize Award Ceremony and opening ceremony for the Abu Dhabi Sustainability Week. The President travelled to the Persian Gulf nation at the invitation of the Crown Prince of Abu Dhabi, Sheikh Mohammed bin Zayed Al Nahyan, who also expressed interest in exploring for oil and gas in Namibia. Namibia and the UAE already successfully cooperate in the Al-Dahra Namibia project, a commercial date plantation established at Naute Dam, in the //Kharas Region in 2009. "Against this background, the Crown Prince of Abu Dhabi has developed the confidence and interest to further explore areas for economic cooperation. President Geingob has invited Sheikh Mohamed bin Zayed to visit Namibia," reads a statement by Presidential Press Secretary Dr Alfredo Hengari. 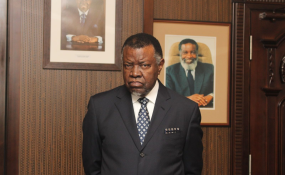 Geingob was accompanied by a Namibian business delegation that attended the business exposition and held meetings with UAE businesspersons and prospective investors in the sectors of energy, oil and gas, infrastructure, agriculture, tourism, technology and finance. The Head of State is scheduled to depart the UAE today when he is expected to proceed to Addis Ababa, Ethiopia, where a Southern African Development Community (Sadc) Double Troika will jointly convene to discuss the situation in the Democratic Republic of Congo (DRC). This precedes a consultative meeting with the African Union on 17 September 2019, on the same issue.